Don’t waste your time ruining your SUV’s on-road dynamics by perverting the air suspension into some kind of lift. Heck why even bother with knobby tires when you can just drive right on to a set of treads? You’re witnessing the “Track-N-Go” portable truck-tread system, which is so undeniably awesome that I would never turn down an excuse to post it. And finally, somebody mounted it on some Jeeps! Basically there are four treads held in aluminum housings that you literally drive almost any 4WD vehicle on top of/into and secure with big clips. The wheels stay in place; they actually drive the tread. It’s like walking on a treadmill that moves along with you. Sort of. Anyway the best part of the Track-N-Go system is that it unlocks 1,680 square inches of contact patch and basically allows any 4WD vehicle to go anywhere without modifying the suspension or changing tires. You also get an instant 8 extra inches of ground clearance. The whole rig weighs a mighty 1,500 pounds and is supposed to cost about $25,000, so it’s not a completely “easy” modification to put on your machine but it is a comprehensive improvement in capability. Also, top speed is cut down to 40 MPH and you’re not supposed to do more than 10 miles on hard surfaces. 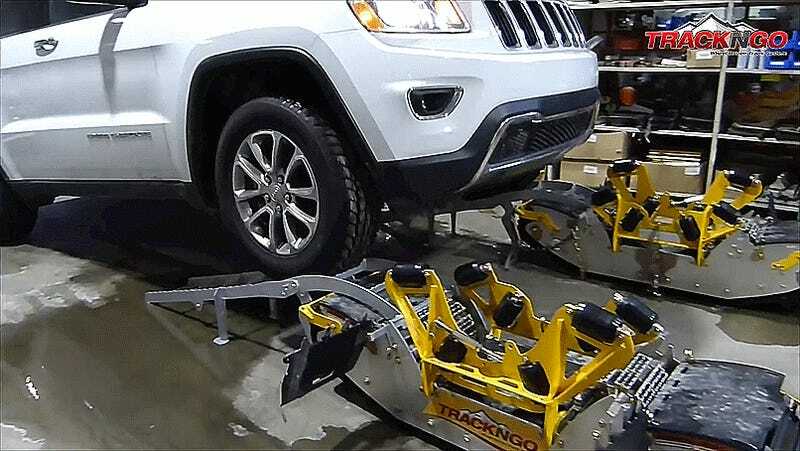 We first saw Track-N-Go in action about four years ago, and the company’s always putting cool new applications of the treads on their YouTube channel.